Figuring out how to combine business with science. We have engineered a three-channel switch that is controlled with the intensity of blue light. By utilizing the mechanisms of the lambda repressor, we are able to switch between the expressions of three different genes with a short delay. This kind of mechanism provides a nearly real-time control over genes, which could provide advantages in variety of industrial bioprocesses. Inspired by the principles of open source software, we introduce an Open Source business model implemented around our switch. We want to encourage future companies to create Open Source based solutions and to empower customers to participate in the product development. Open Source model’s transparency as well as lower degree of protection raises trust and continuity and benefits larger community. We want to share our experiences and insights in biotech entrepreneurship and address the difficulties that students and newcomers may face in the early stages of building a synthetic biology startup. Our pitch video on August 6th, Summer of Startups Demo Day. 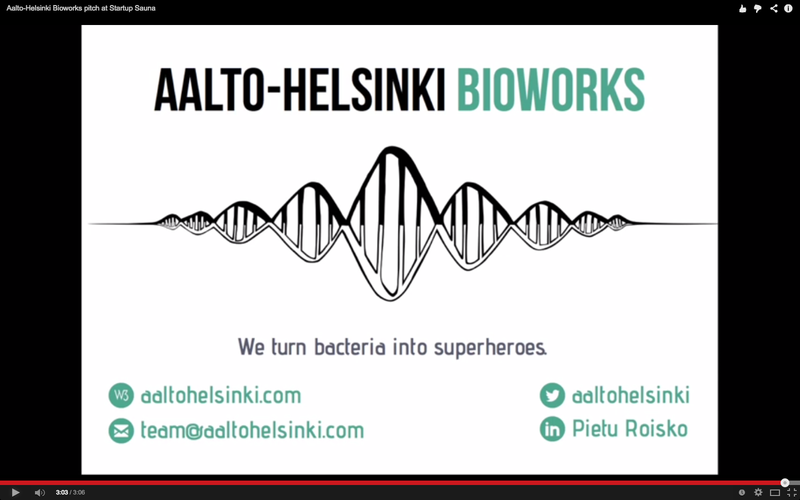 We are Aalto-Helsinki Bioworks, the first-ever Finnish iGEM Team and one of the four teams in the new Entrepreneurship Track. Our team consists of nine students from Aalto University and the University of Helsinki and we are combining our interdisciplinary forces to develop something new and fascinating. We want to put Finland on the map of synthetic biology and improve undergraduate research opportunities in our universities. We have designed a three-channel gene switch that would make it possible to control three user-defined genes with blue light intensity. We are using YF1 as our light receptor protein and the signal is mediated to lambda repressor protein (CI) production via phosphorylation pathway. The concentration of the CI protein defines the gene that should be active at a time. The secret behind this function is our modified version of the lambda repressor mechanism. We constructed a mathematical model that simulates the interactions of the molecules and function of the gene switch we designed. This revealed interesting phenomena in the dynamics of our system which helps us to better understand the capabilities and limitations of the gene switch. We also made an interactive simulation available to everybody to best illustrate how our idea actually works. To control the amount of blue light on our cell cultures, we created the LED rig device. This enabled us to perform diverse experiments in order to characterize our light response element. These results show that our light response element is able to regulate the downstream gene expression precisely. In addition, the response time is in a ten-minute-scale, which enables constant and nearly real-time control over bacterial cultures. In addition, we hypothesize that this system is also applicable to bioreactors, which would enable higher level of control in industrial bioprocesses. However, our fully functional prototype is still under ongoing development. We have developed an open approach to biotech business inspired by the business models for open source software. Following the Open Source philosophy, we will distribute open Aalto-Helsinki Bioworks technologies for free to everybody - as long as they share the improvements made on the technology. Therefore, we empower our users to participate in product development. Our business model is based on hardware and wide range of services offered to our customers. During the summer we participated in Aalto Entrepreneurship Society’s Summer of Startups 2014 incubator programme to learn the essential entrepreneurial skills, such as pitching, investor relations, customer-driven development and explaining the science for general audience. See our Demo Day video for details. iGEM is an international experience and as the first Finnish team, we went to find advice and experience around the globe. We contributed to the iGEM community by building a BioBrick Seeker tool which makes it easy to find parts of your interest in the 2014 BioBrick distribution. This tool has been used by iGEM teams all over the world! We also did a lot of cooperation, including filling out surveys and having skype conversations and live meetings with current and previous iGEM teams from France, Colombia, Switzerland, USA and the Netherlands. We even made a video together with ETH Zürich team to Colombia team’s challenge. We wanted to raise awareness about synthetic biology in Finland and also showcase researchers’ work to young people and undergraduate students. Therefore, we have been reaching out to general public, especially young people via social media, including Facebook, Twitter, Youtube, Flickr and our own blog. We’ve shared stories, pictures, videos and experiences to our followers. In addition, we have been featured in radio interviews and articles on magazines and webzines. We also made a silly game: Flappy Coli. We have a public team webpage, aaltohelsinki.com, where you can find the latest stories of Aalto Helsinki also in the future. We lifted some of the highlights of this project on a timeline: the story of Aalto-Helsinki Bioworks is there for you to see! Our wiki has seven different categories in addition to this main page. On each of them you can just scroll through the content until you're finished reading. Everything about the subject can be found on one page, additional material is provided when possible and pages discussing similar topics are linked to each other. A submenu will also appear when you start scrolling through the other pages: see the top of the page as you advance in the wiki! We are a team of nine Finnish students and we've gotten amazing support during this project. We explored the possibilities of biotech and synthetic biology business. We engineered a three-channel switch that can be controlled with the intensity of blue light. We made mathematic models of the interactions behind our gene switch. We got to know other iGEM teams and developed tools for everyone to use. We spread the word about iGEM and synthetic biology especially in Finland. We documented the project well. If you find yourself lost (or simply don't know where to start looking for what you'd want to find), here's a sitemap to help with the task! This wiki is designed and constructed by Aalto-Helsinki.